Thanks for taking time to check out my website. I think you will find a lot of useful information here as you enter this new and exciting phase of life. If you have not already seen it, please take a moment to meet me and learn how we can best work together to find the ideal community and home for you. 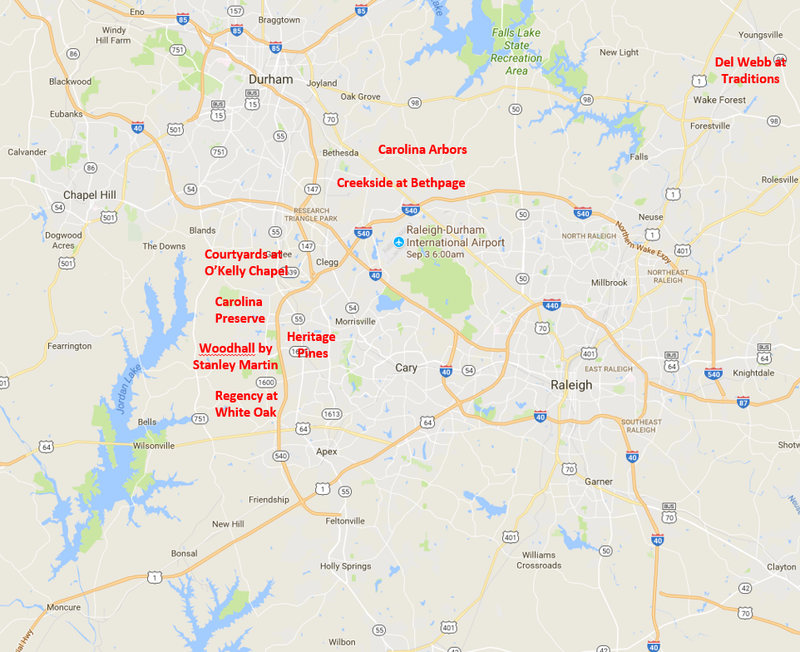 The Triangle area consisting of Raleigh, Durham, and Chapel Hill, plus some surrounding communities such as Cary are in the middle of the state. Drive a few hours West and you will be in the Appalachia Mountains with its mountain streams, outdoor activities, fishing, and amazing fall colors. Drive a few hours East of the Triangle and you will be on the Atlantic coast with beautiful beaches, world class fishing, boating, sailing, and great seafood. Between the two is the Piedmont with its rolling hills, streams, and the largest cities in the state including those in the Triangle. The Triangle definitely has seasons but the fall and its colors before holidays is my favorite. The months of June through August are warm during the day and the months of December through February are cold at night, but the rest of the time the climate is very moderate and comfortable. There are currently 8 major Active Adult communities in the Triangle area which are very popular. Some are brand new and just starting construction, they offer a variety of lots and building options. Some are complete so the only purchase opportunities are resales. If you want an established community, want to move in very soon, want to save some money, and are flexible on construction/lot choices, the resale communities may be your best option. If you have time to build new, you don’t mind paying a little more, and you want to pick your own lot, floor plan, and options, new construction may be your best option. One significant difference in communities are the amenities. Some communities offer only outdoor community spaces, many communities offer a pool and exercise facility, and other communities offer extensive clubhouses, onsite activity directors, exercise/special interest classes, multiple facilities including pools, exercise rooms, and social rooms. Of course the latter cost a little more in monthly dues, but for many Active Adults it is the lifestyle they crave. Most communities handle exterior yard maintenance to make your lifestyle a little more carefree. The following is a map to show you where the major Triangle communities are located. Below are links with more information specific to that community. If any of these communities caught your eye, please give me a call or send me a note and I will provide you with additional information. Feel free to give me a call with any questions you have or if you would like to schedule an appointment to tour communities. I appreciate your interest and look forward to meeting with you!